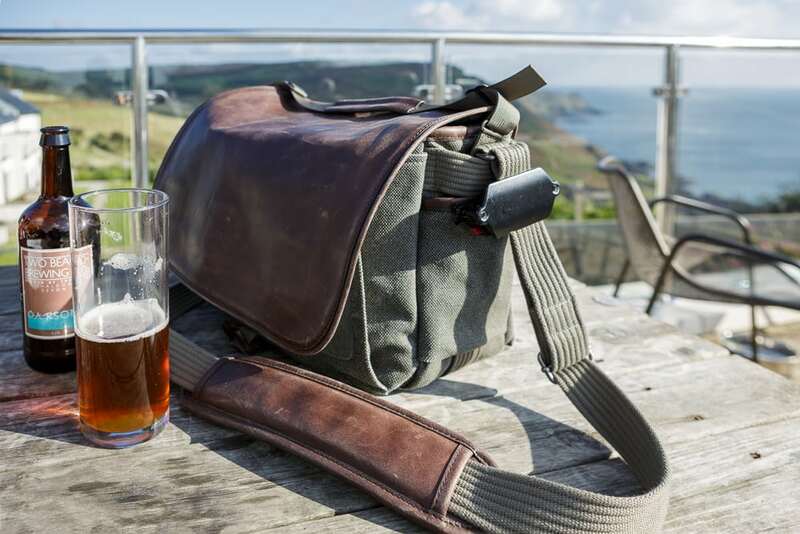 The Retrospective range of ThinkTANK Photo camera bags, when released, were an instant classic. Styling that harked back to a more romantic time when photography was full of mystery and magic. So if the original Retrospective bags are so great, what's with the new Retrospective Leather? Can you make a good thing better? Classic wisdom suggests if it isn't broke, don't fix it.. well obviously ThinkTANK Photo don't hold to that logic! If you appreciate the way an old leather briefcase weathers and ages to perfection, then I think you are going to the love the Retro Leather range. At first, the leather top flap, padded shoulder strap and detailing looks a little on the shiny new side for my liking.. But soon (especially after 2 days shooting at a 150 year old blacksmith's forge) the bag develops a beautiful distressed patina which will improve even further over time. In addition to all the leather accents, this shoulder bag now has a new cross buckle to go with the velcro fasteners. I have found myself using the buckle almost exclusively as I find the velcro a touch distracting around wedding guests or on a photoshoot around town. The original Retro range of shoulder bags goes from the smallest Retro5, to the now retired retrospective 50! Now as you can see from this review, I loved the Retro50 but I may also have mentioned it was a little on the BIG side of things. So if the 50 was too big and the 5 was too small for my needs.. (I needed to carry 3 lenses and a Canon 5D3).. What is the perfect bag for me? What is my 'Goldilocks' bag? The Leather range currently has 3 different sizes.. The 5, the 7 and the 30. Like Goldilocks, one is small, another is big and the 7 is just right (for my own personal needs). I can carry my trifecta of lenses & camera body for walkabouts or add an extra body and a speedlight for a wedding day. The 7 can even fit an 11" Macbook Air in the rear pocket. This isn't a carry everything kinda bag.. but it's not too big, not too small, just right! The only downside I found was that side straps and pockets on the outside of the bag were quite fiddly and small on the Retro 7 and more decorative than functional. Like the rest of the Retrospective range, the attention to detail is superb. The padded shoulder strap is the most comfortable I've ever used and the overall styling is above and beyond the competition. I would like to thank the lovely people at ThinkTANK photo for their continued support and for sending me this bag to try out. Yet again, you have exceeded expectations!